Jaran Teji Dance (Tari Jaran Teji) is one of Balinese dance with the story originated from the Panji Cycle. This is a story about heroism and love focused on two figures, Raden Panji Inu Kertha Pati (Panji Asmarabangun) and Dewi Sekartaji (Dewi Chandra Kirana). Both are told as the incarnations of Kamajaya and Kamaratih on earth. Jaran Teji was created by dance artist I Wayan Dibia in 1985 and music accompaniment by I Nyoman Windha. This dance combines the movements of the male dance and female dance (bebancihan). The dance movement was inspired by the Sanghyang Jaran (sacred dance) combined with classical Balinese and Javanese dance movements. This is a group dance by 5-7 female dancers. A group dance depicts joint or group activities. The dancers display uniform and compact movements. Not infrequently dancers divide themselves to perform mutually complementary movements. This dance depicts a story about the disguise of Dewi Sekartaji as a male and accompanied by bodyguards, wandering to track her lover who left the palace, Raden Panji Inu Kertha Pati. Dewi Sekartaji disguised herself as horsemen until no one recognized. The choreography structure consists of: Pengawit, Pengawak, Pengecet, and Pekaad. Pengawit is the initial part, marked by the entry of the dancers, the atmosphere of joy and accompanied by medium tempo music. This section illustrates Dewi Sekartaji (Dewi Chandra Kirana) and her bodyguards in horseback riding. Pengawak displays movements accompanied by slow tempo music. This section illustrates Dewi Sekartaji's sadness because she hasn't found her missing lover yet. Pengecet displays a dance movement full of agility and joyful atmosphere. This section illustrates the awakening of the spirit of Dewi Sekartaji to continue the journey, looking for her lover, Raden Panji Inu Kertha Pati. Pekaad is the final part, marked by the dancers leaving the stage, and accompanied by fast tempo music. This section illustrates Dewi Sekartaji rushing to continue her journey. Makeup and costumes are very important in dance performances. The dancers of Jaran Teji wore men's clothing to support the story of disguising Dewi Sekartaji as horsemen (male). At the top, dancers wearing a headdress or "udeng-udengan", consist of patterned cloth that are shaped in such a way and equipped with a forehead crown made of leather and wearing flowers and "rumbing" in the ear. 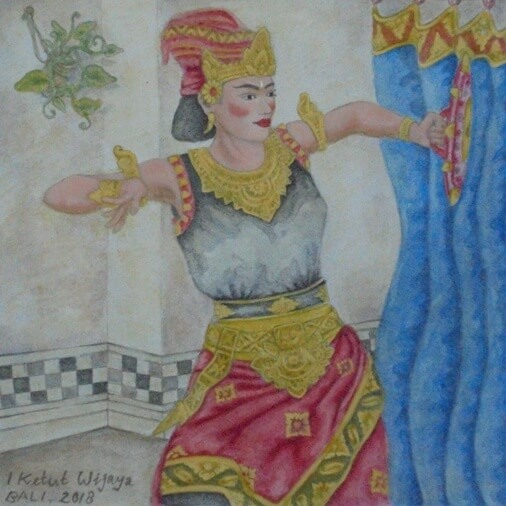 The dancer wears a black vest, badong, tutup dada, sabuk prada (long cloth-belt), gelang kana (upper arm and wrist) and ampok-ampok around the waist. While at the bottom, dancers wearing black short trousers covered in red cloth with gold patterns and wearing bracelets on the ankle. The Jaran Teji dancers carry dance property namely "tameng" or shield.